Cryotherapy is the utilisation of extremely cold temperatures, often used in medical treatment or surgery. Research into the treatment is gaining pace as more people turn to the method for recovering after sports. In the case of sporting injuries, cryotherapy applied either to the whole body, or localised to one area. Whole body cryotherapy for sports recovery can help muscle tissue to recover faster. Following an injury, there is a marked reduction in inflammation and pain when the area is treated with cryotherapy. You can return to sports much faster following endurance events or injuries following treatment with cryotherapy. Whole body cryotherapy has been available for around 40 years, however, the benefits of it are only recently becoming more widespread. It has been used in the USA for more than a decade in sports therapy, particularly for high-impact sports such as MMA, UFC, boxing, Jiu-Jitsu, and also for sports that require repetitive movements such as tennis. It has become a widely used and successful treatment for tennis elbow, an injury that still has fairly limited treatment options. 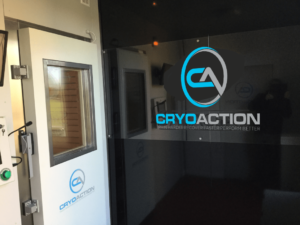 To experience the benefits of cryotherapy for sports recovery and healing, Cryoaction are able to provide either built-in or mobile cryotherapy chambers to your gym, club or spa. Cryotherapy is a non-invasive treatment that can either be ‘whole body’, or ‘localised’. Whole body cryotherapy involves entering a cryotherapy chamber where the extremely low temperature of -135 degrees Celsius results in restriction of the blood vessels. This in turn helps to drain lactic acid out of aching and sore muscles. When you exit the chamber, your blood vessels expand, resulting in an influx of oxygenated blood flowing back to the muscles. The ‘shock’ from the cold is efficient and safe, in contrast to ice baths where the temperature is not monitored which may result in more harm than benefit. Whole body cryotherapy tends to take only 3 minutes to kick start healing with the benefits lasting long after the end of the session. It results in up to 5x faster healing from sports injuries and recovery after endurance events. How Often can you use Cryotherapy? There is no limit to the number of cryotherapy sessions you may have. During treatment, the consistent and deep cold penetrates deep into your tissues giving long-lasting benefits. The controlled cooling method results in even deep muscles recovering considerably faster from swelling and pain.